Evelyne, 12 and in Grade 7, and Emily, 10 and in Grade 5, are half sisters. In addition to a father, they share a love of chicken and rice, reading, learning at school – and lives that have been improved dramatically thanks to the support of Canadian donors to CEDO – CFTC’s long-time Ugandan partner based in Masindi District, western Uganda. Both have blossomed since their father, Byarugaba Michael, began participating in a locally-run Village Savings and Loan Association (VSLA). Michael is now earning enough money to support his extended family, which includes Evelyne’s mother Ruyinza, her six brothers and one sister, plus Emily, Emily’s mother, her two brothers and one sister. Michael has been selected leader of his local VSLA group. 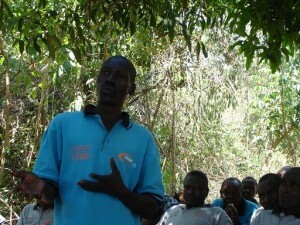 Here he speaks to the group at a community meeting. The entire family lives within a short drive of each other, a common set-up for many Ugandan families. What is less common is Michael’s newfound diligence and long-term view of his children’s well-being – and in particular, the importance of his daughters having what they need to secure a good education. Michael and Ruyinza, both members of a CEDO VSLA. Michael’s wife (Evelyne’s mother) is also a member of a CEDO VSLA. Beyond the ability to borrow money to fund essentials and start-up businesses plus learn the ins-and-outs of credit and savings, VSLAs offer parents critical social support, literacy and life skills education that many wouldn’t have available to them otherwise. Trained VSLA community workers spend time with participants, learning about their lives and challenges, and offering information and resources. These conversations – about family size, family status, the value of education for children, and many other topics – help to increase VSLA participants’ awareness and life skills, as well as their economic standing. “It was clear to me, speaking with Michael and his wife, that he had a real turn-around in his thinking through the CEDO interventions. While the income-generation opportunities that VSLA programs offer is vital to promote sustainable poverty alleviation, the tangential benefits of having one-on-one support around a broader range of issues is no less important and makes a direct impact on children’s quality of life,” said Amboka Wameyo, CFTC’s Regional Program Manager – Africa. Evelyne and Emily share their stories with Amboka Wameyo. Amboka caught up with Michael, Ruyinza, and the two girls – dressed up in their finest to greet guests! – during her recent monitoring visit. Here’s part of her conversation with 12-year-old Evelyne and 10-year-old Emily. Amboka Wameyo: Where were you born? Evelyne: I was born in Kisabagwa village. Emily: I was born in Kisanjo village. It’s far from here, far from Kisabagwa village, although not very far. AW: Do you have brothers and sisters? Evelyne: Yes, I have five brothers and one sister. Their names are David, Robert, Christopher, Joseph, Vincent and my sister is Margaret. Emily: I have two brothers and one sister – Michael (16), Martin (8) and Martha (3). AW: Do you live with your parents? Evelyne: Yes, I live with my parents – both my mum and my dad. My father’s name is Byarugaba Michael and my mother’s name is Ruyinza. Emily: I live with my mother. AW: How has CEDO helped your family? Evelyne: CEDO has helped my father to buy me books, clothes and food. CEDO also helped my father buy a motorcycle. My parents also built this house with money from CEDO. Emily: CEDO helped my father. He pays school fees in time, and buys me books in time. We also eat what we want. For example we eat rice, bananas, posho, chicken. I can’t count how many…. If it is time for Christmas, my parents buy for us dresses. My father bought me a green dress this past Christmas. AW: What do you like best about CEDO’s support? Evelyne: What I like best about CEDO’s support is the fact that the interventions support my school fees and food. Emily: The best thing I like about CEDO is the support to my education, medical care and food. AW: What is different in your life since the CEDO support to your parents through VSLAs and other interventions? Evelyne: Before this new house was built, we used to sleep nine of us in a grass thatched house all nine of us. 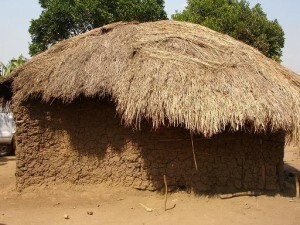 Evelyne’s family – all nine of them – used to live in this one thatched hut. Emily: Life before CEDO was difficult because we could not get enough of what we needed. I was not eating as well as well I eat now. I was not living in a good house. AW: How far away is your school? Evelyne: It is two kilometres away. I go to Kilanyi Muslim Primary School. Emily: I attend Masinde Progress Primary School. It is one kilometre from my house. It takes me one hour to walk to school each day. Sometimes I walk, sometimes I run. AW: What is your favourite subject? Evelyne: My best subject is Social Studies, because it teaches me many things. Emily: My best subject is mathematics. I like maths because I cannot get below 60 per cent in this subject. AW: What is your favourite thing to do outside of school? Emily: Playing and reading books. AW: What is your favourite meal to eat at school or at home? Evelyne: My best food is rice and chicken. Emily on the drive home with CFTC after her visit with her family. AW: What chores do you do at home? Evelyne: I fetch water from the borehole; I collect firewood. Sometimes I cook. When my mother has gone to the garden I cook. I can cook beans, cassava and matoke [a starchy banana, cooked and mashed]. Emily: I wash utensils, sometimes I collect firewood and sometimes I cook. I also wash my clothes. I collect firewood from the forest, sometimes with the neighbours and sometimes with my mother.